It contains 32 Critical Ratios with the instructions such as doughs, batters meat preparations, custards, sauces (pasta dough and pizza dough, sponge cake and pancakes, fritters and crepes, stocks and sauces, crème caramel and chocolate sauce. 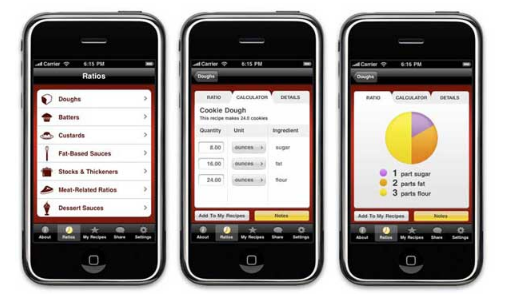 Our students, the chefs of the future will soon consider the iPhone as an essential piece of cooking equipment! Who would have guessed? For more information and to purchase the App visit Michael Ruhlman’s Website. I love the Ratio App and although I considered getting the iPhone I instead opted to purchase the iPod Touch which meant I wouldn’t have to change service providers and I wouldn’t have a large phone bill. This may be a better option for students who don’t want the added monthly expense.